Walking is a popular pastime in England, and I wonder how many people stop to think about what is UNDER their feet? That is the question that the book Granite and Grit: A Walker's Guide to the Geology of British Mountains attempts to answer. The book begins with the author, Ronald Turnbull, discussing how he became interested in the geology of Britain through various school trips and visits to a holiday cottage. The next section of the book concerns the history of Britain. How did it come to reach its current shape and composition? After giving a brief overview of how Britain came to be, the author then gives an in-depth discussion of 17 types of stone that can be found in the country. An interesting feature of the book is that the author describes walks that the reader may want to follow, and what sort of rocks and other features (algae, fossils, etc.) can be found along the route. The book is written in a very engaging and conversational style. The author puts a lot of his own experiences into the text, which helps to make it very relevant to the casual reader. At the end of the book is a glossary of terms, which is very helpful! The book has many, many large and colorful illustrations of not only various geologic features, but also of lovely landscapes. All in all, I found this to be a gorgeous, very informative book about what lies UNDER a beautiful country. Granite and Grit will be released in mid-January and is now available for pre-order through Amazon. 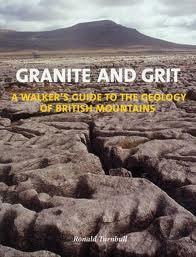 Not sure if we'll ever be able to make that type of trip, but I adore geology - what a fascinating book.